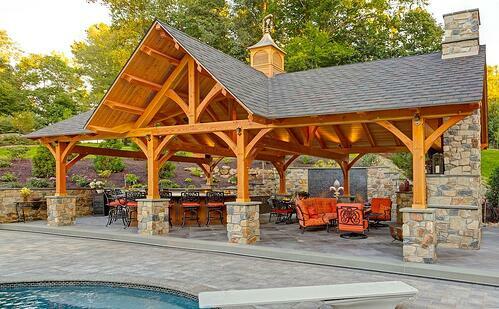 One of the best investments you can make with your outdoor living areas is to add a pergola or pavilion. These structures will help to give your family and guests relief from the hot summer sun and even the rain in some instances. Whether you choose a pergola for some dappled shade or want the full coverage of a pavilion for your home in Reading, York, Hershey or Lancaster, PA, adding one of these structures will allow you to use your outdoor spaces more hours of the day and more months of the year. 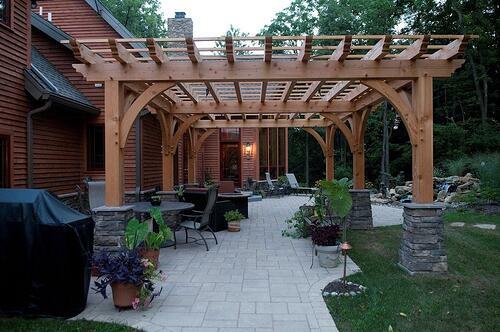 If you’re looking for an architectural element with some old world charm, adding a pergola is a great choice. Pergolas can be constructed out of either PVC or a variety of timber materials such as redwood and cedar. Pergolas can be easily enhanced by adding outdoor lighting for extending nighttime use and beautifully accented with hooks for hanging planters. Another favorite feature to add to your pergola design is incorporating climbing vines that will trail up posts and across the canopy in the years to come for complete shade. Adding a pavilion is a great choice for complete relief from the hot sun and occasional rain showers. Your landscape design can incorporate them to give some shady relief to a nearby pool or pavilions can be added for coverage of outdoor kitchens, lounging, and dining areas. Big or small, your pavilion design can also include an outdoor fireplace, perfect for extending the use of your outdoor living areas even in cooler times. The addition of hanging a television can help the outdoors become your ideal spot to watch your favorite shows or sports. Finish it off with low-voltage LED lighting, and you’ll be able to use your pavilion any hour of the day. If you’re looking for a pergola builder or pavilion companies in Lancaster, PA or surrounding areas like York, Hershey, or Reading, PA, consider your choices carefully. While many pergola and pavilion companies will be able to design and construct a beautiful structure, they may not have the expertise to consider how it impacts the rest of the landscape design of your backyard. Earth, Turf, & Wood’s Registered Landscape Architect will work with you to explore the many facets of how you intend to use your property in the years to come. Exploring these details will ensure that you end up with a pergola or pavilion that helps you get maximum enjoyment of your backyard. We’ve designed and constructed many of these outdoor structures over the years and would be happy to discuss how we can create a unique structure for your property. Feel free to browse pictures of pergolas and pavilions below, and when you’re ready, contact us for a free consultation.